Calling all Nordy girls...or just all of my fellow budget-savvy shopaholics! The Nordstrom Anniversary Sale is on until August 5th. This is Nordstrom's biggest annual sales event of the year. And, unlike most retailers, they are not just getting rid of out-of-season inventory. The Nordstrom Anniversary Sale features a mix of both new and holy grail items. 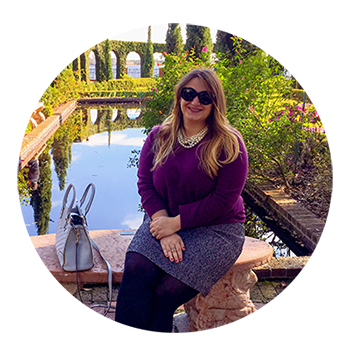 I've rounded up some of my favorite picks (and a few of my purchases) below. Items sell out particularly quick during this sale. So, if you really love something, add it to your cart & check out right away! Happy shopping, ladies! Soprano Cold Shoulder Body-Con Dress - This chic LBD was one of my purchases. It was a steal, priced under $30 and will be great for a girls night out or a special event. I plan to wear it for my best friend's rehearsal dinner. Leith Melange Wrap Dress - I purchased this faux wrap dress in the Red Grape color. It looks so cozy! I plan to wear it on both FSU gamedays and date nights. I'll dress it down for gameday with my Jack Rogers and amp it up for date night with a heeled sandal. Gathered Lace Midi Dress - I didn't yet purchase this dress, but it's definitely on my wishlist. Eliza J dresses are made well (I have several) and are always very feminine. This lace beauty would be perfect for a wedding, date night, or just any time you want to feel beautiful. Perfect Roll Tab Sleeve Tunic - This lightweight tunic is a closet staple. It's a great transition piece - you can rock it day or night throughout the seasons. By day, pair it with a pair of ankle pants and flats. By night, pair it with your favorite pair of jeans (American Eagle are my personal favorite) and heeled sandals. I have this particular shirt in 3 colors - Black, Ivory, & Royal Blue. It's over $30% off, priced at just $27.90 for the Anniversary Sale. So, go stock up! Ruffle Popover Shirt - J. Crew makes the BEST workwear, in my personal opinion. This classic white poplin shirt will ensure that you look polished at work or on the weekend. The ruffles make a classic white shirt a little less boring. Best part? You won't have to run to the dry cleaner every week because it's machine washable. And trust me, you'll want to wear this every week! Resolve Plus Waterproof Jacket - You're probably wondering...are The North Face jackets worth the hype? And, I can vouch...yes they totally are! I own a couple, and both are high quality & keep me oh so warm! If you don't yet have one, I'd definitely consider ordering this one since it's roughly 30% off right now. This particular jacket is perfect for my fellow Floridians since it rains here so often! Zella Live In High Waist Leggings - If you haven't heard of Zella, it's a brand exclusive to Nordstrom. And, these leggings are AMAZING. I have many, many pairs of black leggings, but these are my favorite. They're thick, don't pill, & are SO comfortable. I own both the regular & high waist versions. I prefer the high waist...it keeps everything smooth & under control. If you buy just one thing from the Nordstrom Anniversary Sale, I'd suggest this item! They're normally $54; so, at $35.90, they're a total steal. Zella Body Flight Seamless Sports Bra - In addition to making my favorite leggings ever, Zella makes the best sports bras. I have a very large chest, and it's SO hard to find a good, supportive sports bra. Zella hits the mark again in this category. I have one similar to this Body Flight Seamless style, but it's black. The semi-sheer mesh makes you feel extra cute and helps keep you cool while you're working out (sweating to death in my case, LOL). Sam Edelman Caprice Knee-High Boot - I am a total brand loyalist when it comes to footwear. I have a few favorite brands that I purchase. Sam Edelman is undoubtably my #1. Their shoes are super high quality, timeless, and appropriately priced. The block heel will ensure that these boots will be comfortable and easy to walk in. This pair comes in three colors: Black Suede (my pick), Candy Red Suede & Golden Caramel Suede, and is currently over 33% off. Jack Rogers Lauren Sandal - Jack Rogers is my #2 footwear brand. I have purchased the Lauren Sandal twice over the course of 5 years in the Platinum color. Ask anyone...I wear them almost everyday! They're comfortable, cute & will look great with your Lilly Pulitzer dresses. Stila Good to Glow Liquid Eyeshadow Set - This was one of my Nordstrom Anniversary Sale purchases this year. It's a trio of gorgeous liquid eyeshadows: champagne, gold glitter & pewter/silver glitter. I can't wait to wear the gold with a garnet outfit for FSU gamedays & the others for date nights & New Year's Eve! Va Bien Smooth Satin Hourglass Bustier - Wearing an off-the-shoulder or strapless dress is very difficult with a large chest. But, the right undergarments can be a total game changer. I've worn lace-up corsets, but they're very uncomfortable. I ordered this bustier and can't wait to try it out. This one is affordable and has great reviews. I'll be sure to update this post with my personal opinion as soon as I receive it! Set of 2 Gold Rim Monogram Champagne Flutes - These vintage-inspired Gold Rim Monogram Champagne Flutes are SO glam. I imagine these fabulous glasses stacked in a tower filled with a delicious champagne a la Great Gatsby! I may be adding these to my collection for special occasions but have not yet purchased. Nordstrom at Home Wine Rack - I have a wine fridge in my kitchen, but if I didn't, this gorgeous gold wine rack would be sitting on my kitchen counter right now! 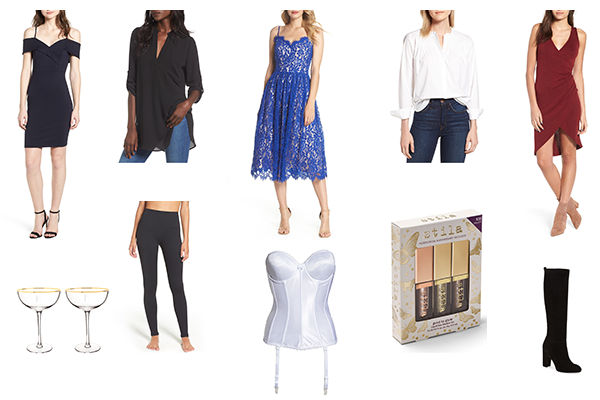 I hope that y'all enjoy my Nordstrom Anniversary Sale picks and that you find some amazing items for your closet and home!